October 30: 6.30pm at Preston community library, Elisa Segrave talks about her book ‘The Girl from Station X’ – a moving story of a hidden life about her mother, among the first women to enlist, who worked throughout WW2 at Bletchley Park and elsewhere. 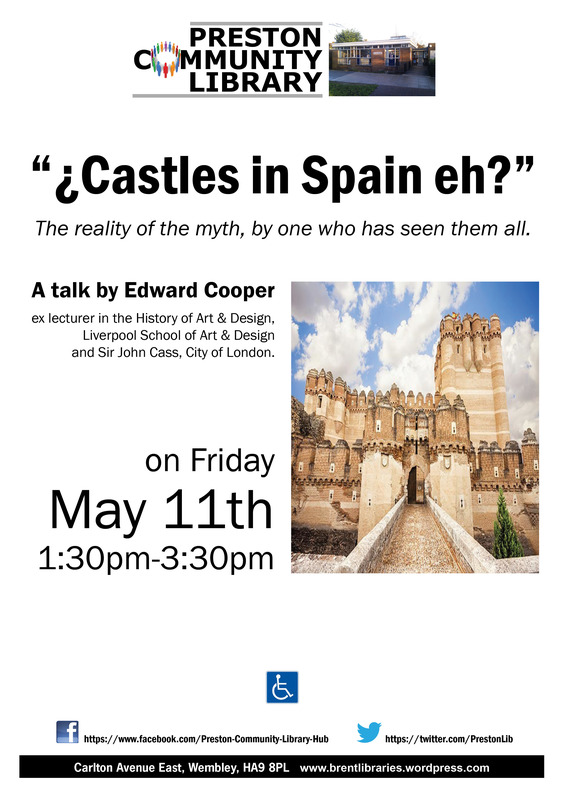 A talk by Dr Edward Cooper former Lecurer in the history of Art & Design at Liverpool School of Art & Design, and Sir John Cass, City of London. From Easter to the end of June, there will be additional quiet study space available in the Library on Mondays and Fridays, from 5-7pm . We hope this will help local school students – especially those preparing for summer exams. The Preston Safer Neighbourhood Team have organised weekly contact sessions at the library. Residents can report crime in person to a Police Officer of seek general help and advice. A Police Offer will drop in at the dates and times below. Their contact details are: prestonwardsnt@gmail.com or 07920 233 753. DOORS OPEN AT 7:15PM. SCREENING STARTS AT 7:30PM. Tickets are free at: thenightcleaners.eventbrite.co.uk or from the library. Humphry Treveyan, will introduce this film made 1970-72, about the campaign to unionise women who cleaned office blocks at night and who were being victimised and underpaid by their employers. Join us at Preston Community Library for celebration of 1960’s Films. Tickets are free at: sixtiesfilmnight.eventbrite.co.uk or from the library. Do you remember what it was like going to the cinema in the 1960s? Did you go to the ABC or into the West End to see the latest film? Was it a big occasion or did you go every week? What stands out from the experience – the films, the cinemas, the atmosphere, the advertisements? Over the last 4 years, University College London has run a research project on 1960s cinema. They collected memories from almost 1000 people of ‘going to the pictures’ half a century ago. Come to the Library on Saturday, September 30 at 7.15 and the team will tell us about the fascinating results of this project. We will also watch a film from the period and discuss our own memories of going to the cinema in the 1960s. DOORS OPEN AT 7PM. SCREENING STARTS AT 7:30PM. Presented by Ray Turner “The Story of Wembley Park Studios” tells the fascinating history from the 1920s onwards of the film and television studios located in Wembley Park, North West London. Recorded before the studio’s closure the film hears from celebrities and crew who were involved in the early days of film and television right through to modern day shows. Hear about shows including On The Buses, Ready, Steady, Go!, The X Factor and Britain’s Got Talent which were all recorded at Wembley during it’s near-100 year history. Come as a team or come on your own and join a team on the evening. Everyone is welcome. There is also a raffle. We had a great summer event at Preston Community Library. There were yoga taster sessions, stalls, music from Leon Rosselson – and the Bake-Off competition produced a wonderful selection of delicious cakes. The winner of the PCL Bake-Off award was Brigitte, seen here with runners-up Frances and Jessica. See below for the bake off entry form! Unseen Voices is a film about ordinary people during the war and in particular, their lives in the run up to D-Day. In listening to their personal accounts your own memories may also be rekindled. There will be a talk about the film project afterwards and an opportunity to share in the discussions. A book about the film will also be on display at the event. Monday, March 20, sees the return of our ever-popular Pub Quiz at The Preston pub – come at 7.30 for an 8pm start. Bring a team or join one of the other tables – we are a friendly bunch! Trevor Dance speaks about his research into the life of French artist, Rodolphe Bresdin on Friday March 17 @7.30pm in Preston Community Library. Preston Community Library will be screening two Buster Keaton silent movies this Saturday. A rare opportunity to see two comedy classics of early cinema. Richard Ross will be introducing the films. Do come along to Preston Community Library on Saturday, Jan 28 from 7.15 pm. As always, films are free to our members, [join at the door] but a donation is requested to finance future films.